In 1870 there was a plan for digging a canal in Holland. Length ~ 75 km. 4 locks. Estimated price (probably optimistic) Hfl 1.500.000,- , which is roughly 750.000,- HCr in my calculations. BTW: What is the keycode for HCr I mean the capital C with a vertical line. Thank you for that - that is helpful. Do you have any idea of what the conversion value would have been to £GBP in those days? I sort of ran across it by accident while reading up on smoke deflectors. cost of one locomotive out of initial batch of ten. Hmm - I have found an alternative source suggesting a different price for the LNER A1. In "The Flying Scotsman (the train, the locomotive, the legend)" by Bob Gwynne (published by Shire Books, ISBN 978-0-74780-770-4) at page 18, the cost of an A1 class in 1922 (the specific locomotive, built by the GNR as 1472 but which shortly became 4472, that bore the name "Flying Scotsman") is reported as being £7,944. I notice that the reference in the Japanese Wikipedia, which is still there, has no source citation. 8600 pounds? Overpriced, I recently bought one of those for less than 10€ . Nice collection - and impressive engineering for z gauge/scale! Z gauge does not seem very popular here (N gauge is what modellers who want small sizes tend to go for); is it more popular over there? The Z gauge models that I have seen tended to be Swiss or German, if I recall correctly. It's a monthly collectionable that's sold here in Spain, features 14 historical trains. In Spain a Mikado (english manufactured I think) train is included, but the collection it's sold across europe I think, I guess including some regional variations. Here in spain there is a strong tradition on H0 and N scale, N maybe more for working model scale modelling, and H0 maybe a bit more for just collectiong materia. I have myself a lot of N material. This new collection is in Z scale, and it's very well detailed,but the locos ofc are not functional. To be honest, I really like this scale, I wish I could just turn all my N material to Z, is much smaller, and it whould be easier to use my tracks on the desk And they are almost as detailed as N. We're starting to see more Z material here, but mostly H0 and N scales are used, because we use mainly german manufactured materials, and they use that scales. EDIT: I googled a bit and in the rest of europe, I think inluding UK is named "atlas editions minitrains", or something similar. I am currently undertaking some research on trams, which has thrown up some useful pricing information, here concerning the construction cost of permanent way. In David Gladwin's "A History of the British Steam Tram" (Vol. 1), the author notes (at p. 14) that the Liverpool United Tramways & Omnibus Company paid £2,800 per mile (£1,750 per km) in 1878 to rebuild the "inner circle" initially built in 1869 (it is inferred that this is upgrading work from permanent way suitable for horse trams to permanent way suitable for steam trams, but the author uses it in a context to suggest that the cost is comparable to the cost of new construction of tramway estimated by the Liverpool Corporation as £5,000 in 1880). At p. 15 of the same work, the author records that 9 miles (14.4km) of track had cost the Sheffield Tramways Company £81,512 to build in 1875, being £5,660 per kilometre, from which it might be inferred that the Liverpool Corporation's estimate might not have been too much of an overestimate after all, although it is to be inferred from what is written immediately before the giving of the quote that the cost relates to building trams on inter-urban roads on difficult terrain. Not strictly pricing, but relevant to the calibration of physics, on p. 13 of the same work, the author duplicates a large passage from the 26th of May 1876 edition of "The Engineer", in which rolling resistance of mainline railway, tramway and road are compared: mainline railway is said to have had a rolling resistance of 9-10lb/ton; road is said to have a rolling resistance of 60lb/ton, and tramway is estimated as having a rolling resistance of 37lb/ton. In relative terms, road has a rolling resistance of 10x that of mainline rail, and tram of about 4x that of mainline rail. I wonder why there's such a difference in rolling resistance - and whether that would be true today (I can't think why it would be these days certainly). Edit - Between tramways and railways that is. The reason given in the article by the Engineer is the presence of dirt on the rails (and, presumably, gunge in the grooves - there are, of course, no grooves on ordinary rails in which detritus can be trapped). Do trams in the UK need to climb/descend steep hills? extra rolling resistance would give them better traction, as a trade off. They do sometimes climb fairly steep hills: the article in The Engineer to which I referred above mentioned gradients as steep as 1/20. This added, it was calculated, 448lbf (1.9kN) of resistance which, together with the base rolling resistance, meant that a tram locomotive had to have a 600lbf (2.7kN) of net tractive effort hauling a 4t tram car, or, realistically, twice that (5.3kN), as the locomotive itself would weigh at least 4t.The 4t tram cars, incidentally, were the weight of those then drawn by horses. The comparative cost of horses and tram locomotives - from the same work at p. 22, it is reported that, in 1906, a mare cost £26 and a gelding (I presume some type of horse a castrated male horse) could be had for £34. A "Wilkinson" type tram locomotive, meanwhile, cost £800 or so in 1883 (ibid). Edit: Further from the same publication at p. 27, it is noted that rails were sold by the ton, so that rails 25% heavier would cost 25% more to purchase, and further that the cost of installation also increased with increasing weight of the rails, as greater manpower was required to lift it into place, and sturdier foundations were necessary to hold it in situ. Edit 2: Some interesting information from p. 30 of the same volume on the running costs of trams. The Stockton & Darlington Steam Tramways Company Limited reported in 1885 that their trams cost 3.13d/mile to run, comprising 1.43d staff costs, .8d renewals, 0.66d fuel (a mix of coke and coal), 0.15d oil, waste and other stored and 0.09d water and gas; this was averaged over 55,286 miles from January to June of that year. These machines were reported as having 7" x. 11" cylinders. Also on running costs, page 34 of the same volume notes that, in England at least, employing a fireman (or "stoker") on steam trams was not the norm (as it always was on railways), as the fire was expected to last untouched from one terminus to the next, although "stokers" as they were there called were commonly found on the tramways of Ireland, albeit those were rather different creatures, with longer distance runs aside, rather than upon, roads, making them more like light railways than true tramways. Edit 3: At page 37 of that same volume, it is suggested that a Wilkinson type (vertical boiler) tram engine ran at 5.55d/mile (as a total cost, including staff cost) on the Blackburn & Over Darwen Tramway. On page 53, it is reported that Kitson built Wilkinson type engines cost 6d per car mile in 1884 compared with Wilkinson type engines built by Thomas Green & Son at 6 1/2d per car mile. Horses were reported as costing 9 1/8d per car mile in that same year. At page 43, some detail is given of a typical Wilkinson type engine built by Beyer, Peacock & Co. (known as being a particularly reputable builder of high quality products): the locomotives were typically 0-4-0 types; cylinders were between 6" x 7" and 7 1/2" x 12" with gearing of 2:1 or 2.5:1; wheelbases were between 1.68m and 1.73m and overall length around 3.66m, with widths between 1.68m and 2m, and 2.74m high. The weights varied between 6t and 8t, and cost (in the 1880s) between £900 and £1,000. This contrasts with the price quoted by Beyer, Peacock & Co. for a larger tram engine with a locomotive type (horizontal) boiler for an Irish tramway in 1896 of £2,990, although the winning bidder on that occasion was Thomas Green & Son with a bid of £1,790 (or £1,948 if paid in instalments, which option the tram company eagerly took). That locomotive was a 2-6-2T with 15" x 20" cylinders, 3'6" driving wheels, a 9'3" wheelbase, 743.5 sq. ft. total heating surface and an overall weight of 36.5 tons. The tractive effort was reported as 13,607lbf. (See page 56). Some details of the cost of a trailer are given on page 54: an all enclosed twin deck trailer there pictured cost the Leeds Tramway Company £245 in 1890, and seated 66 persons, 28 downstairs, 38 upstairs. The weight is not given, but it is depicted riding on two four wheel bogies. Edit 4: Gladwin's work (at pp. 64-5) also has some useful information on Kitson locomotive boilered tram engines, including prices. There were three standard types of Kitson tram engine, No. 1 Standard, No. 2 Standard, No. 3 Standard and No. 4 Standard, of which only the first two were successful, the third being more heavy and expensive with only a small increase in power, and the fourth being considered so impractical that it was barely built at all (and always to a modified version of the "standard"). Standard no. 1 had 7 1/4" or 7 1/2" x 12" cylinders, driving wheels of 27" - 28 1/2", a boiler with 116 sq. ft. of heating surface and weighed 7t gross. The first examples were sent to New Zealand in August 1879, although the price of one is sadly not given. Standard no. 2 had 8" - 8 1/2" x 12" cylinders, 28 1/4" driving wheels, a boiler with 129 sq. ft. heating surface area and a gross weight of 9-9.5t. These were built from late 1882 (the first coming into service in January 1883 in Birmingham) and then cost £675. It is said that Wilkinson engines (built by Wilkinson, rather than Beyer, Peacock & Co.) then cost £750. By September 1883, the cost of the no. 2 Kitsons had increased to £700, and had risen again to £790 by July 1886 (p. 66). Standard no. 3 had 9" x 15" cylinders, 34" driving wheels, and a boiler with a heating surface area of 150 sq. ft. The gross weight was 11t and it appears that they were introduced in about 1886 (from a table on pp. 71-2 of the abovementioned volume). There does not appear to be pricing information on these. Standard no. 4 is not worth detailing. In each case, the trams are of the 0-4-0 wheel configuration. The boiler pressure and firegrate area are not given individually, but some trams exported to Karachi in September 1885 and with 8" x 12" cylinders (suggesting a Standard no. 2 - the most successful of all Kitson designs) is reported as having a pressure of 160psi, a total heating surface area of 129 sq. ft., a wheelbase of 5', and a firebox measuring 2'9" x 3' 1/2" (suggesting a firebox area of 8.36 sq. ft.). It seems reasonable to assume that at least the boiler pressure was the same in types 1 and 3. P. 79 gives some interesting information on some early (1875) designs of tram engine, these destined for Paris (whose steam tramway was not a success and which reverted to horse operation before electrification in 1896), but designed and built by English company Merryweather & Sons Ltd.. They were vertical boilered engines, although not to the Wilkinson patent, weighing 2t with dimensions of 1.6m long, 2.01m wide and 3.35m high; it had 5" x 9" cylinders with a 90psi boiler. The heating surface and firegrate areas are not given. This was the only locomotive built to these dimensions, the second locomotive, also sent to Paris, had 6" x 9" cylinders and weighed 4t. This latter type of engine became the Merryweather Type 1, and an example belonging to the Wharncliffe National Rifle Association, which used it in an annual makeshift tramway on Wimbledon Common for many years (p. 80). Interestingly, the track reported (ibid) on that temporary Wimbeldon Common tramway was a featherweight 14lb/yard (40lb/yard being considered light for steam tramways of the 1880s), which could clearly (if perhaps only barely) cope with the engine's 2t axle load. One might imagine that 14lb/yard tramway might have been common in horse tram times. More details on the Merryweather engines are given from some Dutch records (pp. 93-4), as apparently some of the engines built between 1879-1881 were exported to the Netherlands. These values are given all in metric, and report that those engines had 179mm x 280mm cylinders, 740mm driving wheels (dia. ), 10.3kg/cm^2 boiler pressure, total heating surface area of 11.8m^2, grate area of 0.4m^2, and a maximum speed of 35km/h. The weight is given as 9t, which suggests that these are Merryweather type 3s or type 6s shown on the table at p. 80 (the cylinder dimensions are consistent with type 3s, whereas the weight is more consistent with type 6s - I suspect that these are probably type 3s, the weight in the table on p. 80 perhaps being net of water in the tanks and boiler, as that on p. 94 is described as weight in working order). Wilkinson & Co. Ltd., which owned the patent of the vertical "field" boilered locomotives built under licence by Beyer, Peacock & Co. described above, also built locomotives to this design, as might be supposed. The earlier type of engines (built from 1881) had cylinders of 6" x 7" and driving wheels of 2' 3", although the cylinder size even on the earlier type was later increased to 7" x 9" (pp. 87-89). These (at least the original versions of the type) weighed 5.5t. In 1883, the first of the "heavy" Wilkinson engines appeared with "larger" boilers, 7 1/4" x 11" cylinders, and weighing 9.5t. Like the Beyer Peacock engines above, these were geared (I assume to the same ratios), with a resulting impact on tractive effort and available speed. The boiler pressures, heating surface and firegrate areas are not given, although on p. 91, there is a description of a boiler explosion on a steam powered canal barge using a field boiler supplied by Wilkinson (the cause of the explosion was a bad repair carried out by Mr. Wilkinson himself), the pressure of which was given at 150psi. The price of Wilkinson engines built by Wilkinson & Co. is said to range from £870 to £1,000 (p. 91), and, although the date for these figures or the particular types of engines that they represent is not given, the context on p. 91 at least gives rise to the inference that those prices are intended to be at least comparable with prices of canal boats in 1891. An interesting aside on scrap value (useful when I get around to introducing a system of secondhand sales to other players, failing which vehicles will only be able to be sold for scrap value unless new and unused) is given on p. 66, which reports that a Kitsom tram engine had a scrap value of £20 on the basis of £2/ton, the scrap merchant noting that the engine was almost all wrought iron scrap with no brass work to speak of (implying that scrap values for, say, railway locomotives might well be higher). Another interesting aside on p. 66 is the information concerning the pay of drivers and guards in "the late 1890s", which recorded drivers being paid £1 10s for 64 hours' (a week's) work and guards (presumably the same as conductors) £1 for the same period. This was reportedly higher than in the period before 1894, when the working week was up to 91 hours for "even less pay" of an unspecified amount. That gives a driver's pay as £0.0234 per hour and a guard's as £0.0156 per hour after 1894, or less than £0.0165 and £0.0109 respectively before 1894. It also shows that a driver's pay was 1.5 times as much as a guard's/conductor's pay, which is useful for setting the relative fixed costs of tram engines and tram cars. Another interesting aside is found on p. 91 concerning the cost of canal barges; a steel barge in 1891 is said to cost £500 from Messrs Smith and Company, with engines for them costing a further £336 from Wilkinson & Co (the maker of the tram engines). A number of general themes emerge from Gladwin's work, two of which are worthy of note: firstly, the Board of Trade limited the speed of trams to 10mph (16km/h). Secondly, steam tramways appear to have been either failures or barely profitable, suggesting that profit margins for running these contraptions in the game should be low. Edit 5: Sadly, the chapter on the trailers of tram cars in Gladwin vol. 1 is somewhat lacking, and has little pricing information (although see above on some pricing information on trailers). However, at p. 133, it is recorded that these (double deck) trailers most commonly seated 58 persons (no clue is given as to standing capacity) and were normally enclosed on top, for passengers would be troubled by the emissions of smoke from the engines otherwise. For the most part, the seats were unpadded wood, although some companies cushioned the seats. 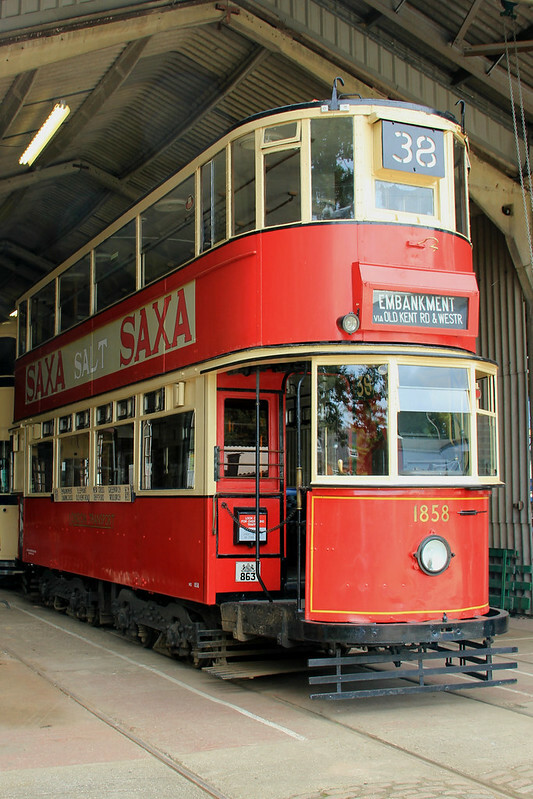 Some dimensions are given on p. 141 of a Birmingham car, although those were to 3'6" gauge and might thus be smaller than a typical standard gauge tram car. Nevertheless, the total length was 29' 1 1/2", overall width 5'9", height 14', empty weight 3 tons 18cwt. This carriage, which was built in 1894, is illustrated on p. 140, and shows a double ended design with traverse ("garden seat") seating on the top deck. The lower deck would almost certainly have had longitudinal seating. It might be inferred that, in the 1870s and 1880s, lighter rail might well have been used. It is further worthy of note that a Brazilian concern used rail as light as 35lb/yard and "Bridgetown" (I assume in Barbados) used rail 40-42lb/yard in weight. Meanwhile, the Dublin United used 90-94lb/yard, but, it is noteworthy, as stated above, that Irish trams were often more like light railways than true urban trams. In general, it is said that that the wear (and therefore the maintenance) of tramways was considerably greater than that of ordinary railways, and likewise that the cost of laying them in the first place was higher, but no quantification is given. Finally from volume 1, a somewhat random piece of information on p. 170: a pair of LNER Class Y10s (a sort of tramway engine) were supplied in 1930 to the Wisbeach & Upwell Tramway (a tramway more similar to the typical Irish concern, being more in the way of a light railway) at a (I presume combined) cost of £4,720, but only lasted on that concern for a year before being relegated to shunting duties at the quay, where they survived until 1952. Edit 7: One matter that I forgot to mention in the previous posts is that the Board of Trade prohibited the hauling of tram cars in a train, so that the maximum that was permitted was a single tram locomotive and one trailing car. Volume 3 of "A History of the British Steam Tram" by David Gladwin (published by Adam Gordon, ISBN: 978-1-87422-60-0) contains useful information relating to particular tramway concerns. Chapter 2, concerning the (standard gauge) Dewsbury, Batley and Birstal Tramway Company Ltd., which was one of the more successful steam tramways, has some particularly useful information. That line, when initially laid in 1873 (as a horse tramway), used track 41lb/yard in weight (p. 19), but when an extension was built in 1881/2, 55lb/yard track was used (p. 20), although at p. 25, it is noted that the renewal of the existing rail in about 1880 used 72lb/yard stock. The cost of the extension, laid with 55lb/yard rail, is summarised in a table atop p. 20. That extension, some 1.13 miles (1.808km) cost £2,370-14-0 for the way alone, or £4,240-14-0 for the way together with the cost of repaving the road, of which £1,010-10-0 was the cost of the rail itself (excluding sleepers, fixings, etc.). This gives a total cost of £2,345.52 per kilometre. As to the engines run on that line, the Merryweather type with locomotive boilers were preferred. The first locomotive for the line is recorded (p. 23) as having arrived in 1879 as a standard Merryweather class 2, with 6 1/2" x 10" cylinders, 2' 2" wheels (in an 0-4-0 arrangement), a weight of 5t, a total heating surface area of 169 sq. ft., a grate area of 3.7 sq. ft. and a boiler pressure of 140psi. It cost £725 when new (p. 30). Secondhand engines of the Merryweather type 4 design were purchased from the ill-fated North London concern in 1898 (the locomotives having been new in 1885), these were described as being "relatively large" with 7 1/2" x 12" cylinders, 2' 4" diameter wheels and "somewhat larger boilers", whose dimensions are not given in any detail (p. 30). The cost of these locomotives, either new or secondhand, is not given. The earlier locomotives, meanwhile, were scrapped (presumably together with the later locomotives) in 1905 when the line was electrified, and these fetched £26 in scrap value (p. 33). On the subject of the trailers, the first, obtained when the concern was a horse tramway, were described as "standard" products from the maker Starbuck, and seated a total of 32, 16 on each deck (p. 32). No indication anywhere is given of tram trailers' standing capacities, but frequent references are made to them often being overcrowded, and there are many photographs of them in this state, so standing must have occurred frequently. In 1874, whilst still a horse tramway (the line opened in 1873 and, as stated above, purchased its first steam locomotive in 1879), it purchased (secondhand) two larger cars from the Leeds Tramway Company, also built by Starbuck, seating being a total of 40. These were rebuilt to enclose the tops, and, as rebuilt, weighed something of the order of 2.5t (the weight of the old horse carriages is not given). In 1886, larger tram cars were obtained, again from Starbuck, these seating a total of 66. Further cars ordered in 1898 were of a similar pattern with only minor differences. The running costs of the Dewsbury concern receive a detailed treatment. At p. 24, it is reported that, in the year 1882, 7 1/2lb of coke per mile was used (on this rather flat tramway with no difficult gradients, although elsewhere on the same page, the figures of 7lb/mile and 6.911 lb/mile are given), costing a total of 3.81d/mile (presumably, as with other per mile figures, including staff costs that in Simutrans should be a fixed monthly/hourly cost). The Wilkinson type engines of other tramways, by contrast, were recorded as consuming as much as 21lb of coke per mile at a total cost of 4.5d/mile. In 1880, the cost of coke was said to be 23s-6d/ton, which, at 6.911lb/mile, cost 0.872d/mile. It is noteworthy, therefore, that barely more than one fifth of the running costs of trams were fuel costs. Page 25 gives a more detailed breakdown of tram running costs in the form of a table, from which it can be deduced that 7s-6d (90d) per day out of a total running cost of 13s-5 1/4d (161.25d) per day comprise wages, or a total of 56% (90 / 161.25 = 0.558139535) are staff wages. If, however, we subtract the mechanic's wages of 1s-6d (18d) on the basis that the mechanic's wages form part of the variable cost, as the mechanic is more needed the more that the vehicle is used, this gives a total of 45% (72 / 161.25 = 0.446511628) fixed cost, and, of the remaining variable running cost (72d), 87% (62.75d) is the cost of the fuel. These figures relate only to the engines, not the tram cars. However, this report is of the running costs of the engines when new, and might underestimate the cost of repairs somewhat. The profit margins in 1883 of various tram companies are shown in the minutes of the Dewsbury's annual general meeting of that year, reproduced at p. 27. The expenses of the Bristol tramway company were 85% of receipts, Derby 80%, Edinburgh, 79%, Hull 74%, Leeds 88%, Sheffield 93%, Wolverhampton 80%, Nottingham 80%, Stafford 84%, Southampton 83%, Wigan 85% and the Dewsbury itself only 63%. Edit 8: Some information of more limited usefulness from some other chapters. On p. 40, it is reported that the (standard gauge) Drypool & Marfleet Steam Tramway Co. paid between £500 and £600 apiece for some Thomas Green tramway engines in May 1889 (a caption on a picture on p. 41 gives a figure of £604 per engine). These were compound engines of two cylinders in an 0-4-0 arrangement with a 5ft wheelbase. Boiler details and cylinder dimensions are not given, but the overall length was given as 11ft 6in, a width of 6ft and a total height of 10ft 4in (not including chimney) (p. 39). The locomotive compounding was said to give some economy, with a locomotive cost of 2.5d/mile, and what is described as a "total traffic cost" of 3.6d/mile and 5.42d/mile. The lower cost is ascribed to the earlier period of that company's life (in 1892-3) and the higher cost to a later period (1898-9), which, it is reported, was due to an increase over that period in the maintenance of engines and cars (combined, it is to be inferred) increasing from 0.5d to 2.0d per car mile in that period (p. 42). Speeds on that line were limited to a maximum of 8mph (p. 39). The tram cars, meanwhile, cost either £240 apiece (there were 8 of them) and were built by G. F. Milnes of Birkenhead (p. 40). These had 8 windows and seated 74 (they are pictured on p. 41 as being double deck enclosed bogie carriages; the caption to that picuture rather contrarily gives a different cost for the trailers, suggesting that they cost £340 each and that there were only 6 of them). The Drypool & Marfleet seems to have used 75lb/yard rail (p. 38). The total construction cost for the whole length of the tramway was in the region of £8,000 (p. 40) for a tramway 1 mile 27 chains long (2.1522km), giving a cost of construction of £3,717.13/km. This compared favourably with the City of Oxford's horse tramways at £10,946 per mile (£6,802.98/km) and the Southampton tramways at £13,380 per mile (£8,315.72/km) (ibid). (Some other comparative costs per mile are given on p. 99, but these appear to be for tramways of a narrower gauge and therefore not strictly comparable). Edit 9: In 1891, the Gurnsey Tramway (about 3 miles in length) electrified its route at a cost of £3,850, giving a cost of electrification of £2,392.79 per kilometre (p. 112). The line initially used Merryweather Type 2 engines (7" x 11" cylinders) at a cost of £700 each in 1877 (although the tramway did not run until 1879). The line was closed in 1931 (p. 113) after, according to Wikipedia, a study was carried out discovering that tram transport then cost 9d/mile compared to 'bus transport at 5 1/2d/mile. Edit 10: At p. 149, it is reported that a Kitson engine delivered to the Huddersfield tramway in 1889, with cylinders of 9 1/2" x 12", consumed 80% of the coke that was consumed by a Wilkinson engine of 1885 with 7 1/4" x 11" cylinders. The Kitson engine is reported to have been more powerful, but it is not clear by how much. Horse haulage on a branch of the Huddersfield Tramway (to Moldgreen, a somewhat steep section) was said to have cost £810-6-8 per annum compared to £482-4-3 for steam - the steam traction therefore costing around 60% of the horse haulage. P. 150 gives the annual accounts for the Huddersfield Corporation Tramways in 1892 (one of the earliest to be "municipalised" or nationalised in modern parlence, largely for want of private operators in that area). Of particular interest is the entry for permanent way maintenance of £6,654. Gladwin gives the length of the tramway as 17 miles and 5 furlongs (28.4km), giving a per km maintenance of the permanent way of £234.30 per annum (or, for Simutrans purposes, £0.04 per km nominal 16 hour working day or £0.002507446 per Simutrans hour). This was, however, a heavyweight 98lb/yard track (p. 148) - it is not clear whether the maintenance would have been higher or lower if a more typical, say, 77lb/yard track had been used. It is notable as a general theme of the works that single lines with passing places were the most common mode of operation of tramways, and service frequency was quite low - down to 40 minutes on the Huddersfield concern (although as much as 5 minutes on a much shorter line in Kingston-Upon-Hull). This is relevant to the applicability of the above figure for the permanent way cost as well as for operational purposes (it seems common practice in Simutrans instead to have a one way system in adjoining streets). Edit 11: Much useful information comes from Gladwin's histories of the Leeds and Leicester systems. The Leeds system, which started in 1871 as a horse tramway, initially used track of 48lb/yard (p. 170). These were eventually replaced with 85lb/yard rail in 1881 (after an intermediate and somewhat experimental type was used unsuccessfully; p. 172). The "basic" cost of laying this rail (that is, with all required materials but without labour) is said to be £2,348-8-per mile for double track, or £1,459.54 per kilometre. Leicester, meanwhile, an almost exclusively horse operation apart from a few experiments, laid in 1877 rail of 47lb/yard, costing a total of £3,000 per mile of single track (including labour; p. 209). That equates to £1864.51 per kilometre. The labour cost is not clearly separated from the materials cost here (there is a description of "providing and laying... granite" as a single item), so a clear comparison with the above cost is not possible. Returning to a theme in one of the earlier posts, that of rolling resistance, the rolling resistance of a tramway appears to have been tested in Leeds (p. 171), and those tests came out with a rolling resistance of 26lb/ton - somewhat less than the 37lb/ton estimated by The Engineer in the 1870s. However, the rolling resistance was noted as being variable: "often much more, sometimes less". Dirt in the groove was said to be the main cause of this being considerably higher than on railways, and experiments in Paris showed that removing the flanges from some of the wheels greatly reduced this figure (ibid). Meanwhile, an excerpt on p. 127 suggests that, on tight corners, the rolling resistance can double from that on straight tram track. As to the tramcars on those lines, the Leeds system had cars built by Starbuck originally that are said (p. 170) to be of two designs dating back to 1860, the first being a double decker seating 40 people and weighing 2.6t and the second being a single decker weighing 2.2t and carrying 18 people. Later (sadly, no date is given) light weight cars of 1.9t seating 36 were delivered. I assume that these cars were all those used in horse haulage days. No costs are given for these early cars, but, on p. 204, a table is given showing the cost, introduction date and seating capacity (but not weight) of later cars. In 1883, Starbuck supplied 44 seat double decker cars costing £210. Similar cars were supplied in 1884, this time costing £235. In 1885, a larger design of cars, carrying 54 passengers, were delivered at a cost of £260 each. In 1887, cars with a capacity of 60 were obtained for £225 each (this time from the Ashbury company, which might explain the lower price), and larger cars again in 1888, seating 66, again from Ashbury, for £242. Similar cars were ordered down to 1890, their price fluctuating during that period between £237 and £245 each. The running costs of the tram cars on the Leeds system (sadly not broken down so as to be able to discern costs per unit of time rather than per unit of distance) are discernible from a table on pp. 186-7. In 1887, for instance, 63 cars operated, the cost of repairing which was £2,427 (or £38.52 per car). The cars had run in that year a total of 798,820 miles, giving a cost per car mile of £0.000048226, or £0.000029973 per car kilometre. By comparison, in 1890, there were 68 cars in service, running a total of 857,642 miles and costing a total of £3,627 to maintain, giving a total of £53.34 per car or £0.000062192 per car mile (being £0.000038652 per car kilometre). P. 212 gives an interesting table in which the fixed cost of horses is calculated on the Leicester system. The average cost per horse per week was said to vary between 11s-10.33d and 11s-5.73d in 1899-1890 (that is, in decimal currency, £0.59 - £0.57). It is said at p. 173 that "one engine was equal to 14 horses, allowing for changes, food &c.", which gives rise to an interesting point: we should probably multiply by 14 the weekly cost of horses to make them equivalent to the steam engines, giving us £8.12 on average. The question then arises as to whether this needs to be done for the difference between, say, steam and diesel/electric locomotives, too, and whether this needs to be factored into the purchase price, or whether it should be accommodated entirely in the fixed cost (the latter would have the advantage that the purchase prices would not need to be distorted from inflation adjusted derivations of the actual cost). The renewal cost of horses on the Leeds system is given in the 1894-5 accounts on pp. 194-5, where the amount is given as £4 per annum, equating to £0.08/week. It should be noted, however, that this figure is not directly comparable to the above, as this is renewal rather than maintenance (horses, being mortal - and especially so when called upon daily to pull tramway cars - needing to be replaced periodically). The Leicester figures do not include renewal, so some combination of the two is of benefit. On the above figures of the cost of horses, the working life of a tram horse seems to have been a little over 7 years in these times. This is relevant when I introduce the system of overhauls: horses would need to be "overhauled" (i.e., renewed) the equivalent of once every seven years at a cost equivalent to their initial purchase price. The comparative running cost of horse and steam trams are again compared at p. 173 in relation to the Leeds system, with similar results as previously: the horse traction is said to have expenses of 9d/mile as compared to 5 1/2d for steam. On p. 148, a similar comparison is made, where it is said that a saving of 3 1/2d/mile was made by steam over horse transport (3.5 being the difference between 5.5 and 9), and, of note, it is said that this was based on a direct comparison at the same time, as there was a time when some lines in Leeds, owned by the same company, were horse operated, and others steam operated. As to motive power, the Leeds system used mainly Kitson engines after some early experimentation with engines of the Wilkinson design. Some interesting statistics are given of these engines in an extensive table on pp. 199 - 202, comprising, not just details of the Leeds engines, but details of all of Kitson's tram engine output, including weights and boiler details. Kitson made tram engines between 1876 and 1891 and in that time produced nearly 250 of them. Cross-referencing with earlier in this post, the "Standard no. 1", built in 1879 for the first time, appears to have had a wheelbase of 4ft, a grate area of 5.17 sq. ft. and a boiler pressure of 155psi* (all other details already being supplied), the "Standard no. 2", first built in 1884, had a wheelbase of 4ft6", a fire grate area of 6 sq. ft. and a boiler pressure of 160psi (other information having been provided above). "Standard no. 3" does not seem to have been particularly standard at all, but an engine conforming to the basic description above was built for the Birmingham system in 1885, and had a boiler pressure of 160psi with a fire grate area of 8.8 sq. ft.. The wheelbase appears to have been 5ft. * The pressure seemed to vary: I have taken 155psi as the pressure of the engine supplied to the Leeds system, although anything between 150 and 160 appears to have been built. Returning to the subject of wages: in the Leeds system, in 1900, tram drivers were receiving 6 3/4d per hour and guards 5 1/4d per hour (after they had been working for 6 months; lower wages applied before that time). I thought that it would be prudent to start a new post rather than continue to edit the above, which has become very long indeed, to mark the distillation here of material from a new book, London Tramways by John Reed (published by Capital Transport, ISBN 1-85414-179-1). In general, save for an unsuccessful North London company, most London tramways went straight from horse haulage to electric power with no intermediate steam stage: a few other experimental systems, such as compressed air, were tried and were partly successful in places, but the only systems of traction that gained widespread adoption in London were horse and electricity. Dealing initially with horse trams, the first horse system in the UK was in Birkenhead in August 1860 (p. 8) , which gives the introduction date required for the earliest horse tram equipment in Pak128.Britain. The earliest tram cars to run in London (albeit short lived on account of the rails protruding from the surface of the road interfering with other road traffic) was in 1861 on three separate routes, one using single decker cars with room for 24 seated and 12 standing (built by a Birkenhead firm), and two using cars with a capacity of 48 (it is not clear what proportion of those passengers were standing and what seated) built by the Oldbury Railway Carriage and Wagon Company. The latter is pictured on p. 8, and is shown as a single deck car hauled by two horses. One supposes that the former was intended to be hauled by a single horse. By the 1870s, when horse trams had become mainstream in London, there was, according to the author (p. 13) some degree of uniformity amongst the designs of trailers: a seating capacity of 46 on two decks was the norm (these were four wheeled rather than bogie cars), although there were a few on one route that seated 52 and operated between Poplar and Aldgate. A few single deck tram trailers were used, seating 18 or 20, and these required only one horse to haul them, the others requring two (sadly, the weight of this lighter type of trailer is not given, although cross referring to the above post, one might imagine a weight of 2.2t for the lighter cars and 2.6t for the 46 seat types). According to a caption on p. 21, in 1895, a new design of tram trailer was introduced, with traverse ("garden seat") seating on the upper deck in place of the central longitudinal "knifeboard" seating that had predominated before, in parallel to the like development in omnibus design. On p. 11, horses are said to cost £25-30, which had to be 5 years old to be strong enough to pull trams. Happy Newyear and also to everyone involved. In my DRC-math in 1900 1 Pound = 5,68 HCr. It should be noted that, although in the Victorian and Edwardian periods, there was little inflation, there was substantial inflation during the First World War, such that prices after that time are not, without the aid of inflation statistics, comparable to prices before that time. Returning to London's trams, now in the electric era, there is sadly little in the way of pricing information in the remainder of Reed's work, although there is a little, and is also much in the way of useful information about the various classes of tram car (although sadly rarely their weights). On page 32, it is suggested that a typical lifespan of a tram-car was expected to be 20 years, and some surpassed this expectancy. In 1906, the Erith Council purchased small 20 seater electric single deck trams on four wheel rigid underframes equipped with two 27hp motors at a cost of £675 each (page 59). 1934 statistics from the London Passenger Transport Board showed that, in its first whole year of existence, £6.3 million had been expended on 327 route miles of track (page 87). This would have been maintenance and renewal rather than the building of any substantial new lines, but would have included some short new sections linking formerly disconnected systems, and above average costs for renewal of tramways formerly run by impoverished local authorities such as Bexley, whose tracks had been substantially renewed on being taken over by the LPTB, and are thus not entirely representative of basic upkeep costs. The 1935 figures for track (on page 90) are probably more reliable. In that year, only £488,400 was spent on track, the route mileage having decreased to 324, giving £1,507.41 per route mile per annum, or £936.86 per route kilometre per annum, although a route mile was not the same as a track mile, as much of the tramways were by then double tracked, and some of that cost might well have gone on lifting track given the decrease in route mileage from the previous year. In the summer of 1934, it was planned to overhaul a number of trams of the E/1 type, which was projected to cost £100,000 for 250 trams (i.e., £400 per tram; page 89). This included some fairly substantial cosmetic alterations to the exteriors as well as fully enclosing the front areas which had hitherto been open even though the passenger compartments had been enclosed. It is said at page 119 that, before the Second World War, trolleybuses had cost less to run than motor 'buses, but that this advantage had been eliminated by 1946, although it is not immediately clear whether this was as a result of particular post-war conditions, or whether this was part of a longer term economic trend: the total abolition of trolleybuses throughout the entire UK thereafter suggests rather the former. On the individual tram cars, the London County Council (LCC) used a conduit rather than an overhead system for its trams - one of the only operators in the country to do so. It was much more expensive to install and maintain than the overhead system, and its only advantage over it was aesthetic; I do not, therefore, propose to add this as a separate electrification type (even though the earliest Blackpool electric trams also used the system, which was quickly abandoned when it was realised that this was not a good idea on the sea front). Nonetheless, many of the LCC cars also carried trolley poles to enable them to work on other parts of the system, so those cars are potentially worthwhile including in the Pak128.Britain fleet. In 1903-4, the LCC ordered a total of 400 trams, 100 of each of four classes, A to D (page 38). A and D were bogie types, whereas B and C were four wheelers. All were open top double deck vehicles with wooden seating, longitudinal on the lower deck, traverse upstairs. Classes A and D carried 66 seated passengers, whilst B and C had space for only 56 (and were presumably less comfortable on account of their more basic suspension). Unfortunately, the cost difference between the two is not clear. The A and D classes were 33ft 6in long, whereas the B and C classes were 28ft 9in long (page 39). Weight is not given. Classes A, C and D were powered by 30hp motors (it is not stated how many per car; I suspect two), whereas class B had 25hp motors. All these cars were retrospectively fitted with covered tops by 1907, although many still had open balconies, and all had open front driving positions (only in 1931 did the police permit front windscreens, which had for some reason earlier been considered unsafe). In 1905, the LCC ordered a new class E, and built 300 of them (page 41). These were of a bogie type and fully enclosed from new (apart from the driver's position). These were also 33ft 6in long, but only 15ft 9in high. The bodies were apparently of "sturdier construction" than previous cars (implying higher weight), but actual weight is not given. Most class Es were fitted with (again, I assume two) 42hp motors. Classes F and G were single deck cars seating 36, which ran through the Kingsway tunnel before it was enlarged (p. 41). They were 33ft 6in long, ran on bogies, and were 11ft high. Power and weight are not given. Class E/1 were built between 1907 and 1922 and numbered 1,000 in all (p. 42). These double deck bogie cars had a seating capacity of 78 (still unpadded). The earlier batches had the 42hp motors, whereas those built in the 1920s had either 50hp or 63hp motors (again, I assume two per car). In 1924, the older cars were retrofitted with 60hp motors, and the older motors from the E/1s were used to replace those on the A-D classes. Class M were built in 1910, being a four wheel shortened version of class E/1 designed for hilly areas (presumably, the idea being to reduce the size and weight whilst retaining the same amount of power, and have 100% adhesive weight). These carried 62 passengers. Dimensions are not given, but I assume that they were of similar length to the earlier classes B and C.
Class HR2 were built in 1930: they were bogie cars, some 34ft 8in long, with Metropolitan-Vickers 109 series motors (p. 74) intended for hilly routes (hence "HR"). The power of those motors is not given in Reed's work, but this Flickr caption suggests that they were 35hp each. Seating capacity is not given. This website suggests that they weighed about 20t. Trailers were used for a brief period in the 1910s but not found to be a success, and I will not detail them here. Likewise, petrol electric trams were tried, but were found to be too noisy and costly to be viable. Another major user of trams was London United Tramways, a company closely connected to the emerging Underground network, and, unlike the LCC, a private operator. They adopted a red and cream livery from the outset, and all cars were bogie cars. Their first type of tram, the Z class, was built from 1901, and was a double decker open top type (page 66), seating 69. These two 25hp BTH GE58 motors according to this source. They were enclosed in around 1914 (ibid). The subsequent class X, built in 1902, were virtually identical. Edit: The price of a new LUT X type tram is given in a picture caption on p. 66 as being £669 in 1902. It is said that these (which had upholstered seats and curtains on the lower deck, but were open topped) had 2x25hp motors. In 1906, the LUT built type T, the first to have an enclosed upper deck from new (p. 67). These cars seated 74, but, oddly, no information is given as to the power of the motors (one might perhaps guess at 2x 30hp motors for this enlarged vehicle). According to this Google Books preview of "London United Tramways: A History 1894-1933", the T class were re-motored in 1925 with new Metropilitan-Vickers motors. The actual power of these motors is not given, but it is said that the motors weighed 39lb/hp compared to 81lb/hp of the originals. If we assume that that the original motors weighed the same as the new motors, and that the original motors developed 30hp, one might deduce that the new motors developed 62hp, which seems consistent with the newer motors of 60hp fitted to some of the LCC cars at around this time). These new motors caused the refurbished trams to be able to accelerate from 0 to 12mph (19km/h) in 8 instead of 9 seconds and to 20mph (32km/h) in 24 instead of 42 seconds. On a test service of six five second stops in every mile, the newly re-motored tram cars could reach an average of 13.5mph (22km/h) compared to 11mph (18km/h) of the cars with original motors. The same refurbishment also included upholstered seats (albeit reducing capacity by 6), and the new motors were quieter running, both of which would have increased comfort. These privately operated trams were the first to have upholstered seats in the London area. These trams had faster boarding and alighting time than other trams, and were the first to have heated interiors (ibid). According to this document, they seated 64 people (and I suspect had a higher standing capacity than earlier cars due to their spacious interior). Power is not given by Reed, although the type of motor (either a GEC WT29 or DK131) is specified. I cannot find information on the power of these motors. The LCC also planned in 1930 a similar large, modern type of tram, but only a prototype "Bluebird" was built before it became apparent that the LCC was to have its transport infrastructure confiscated by the LPTB, who decided within months of their creation to replace all trams with trolleybuses. 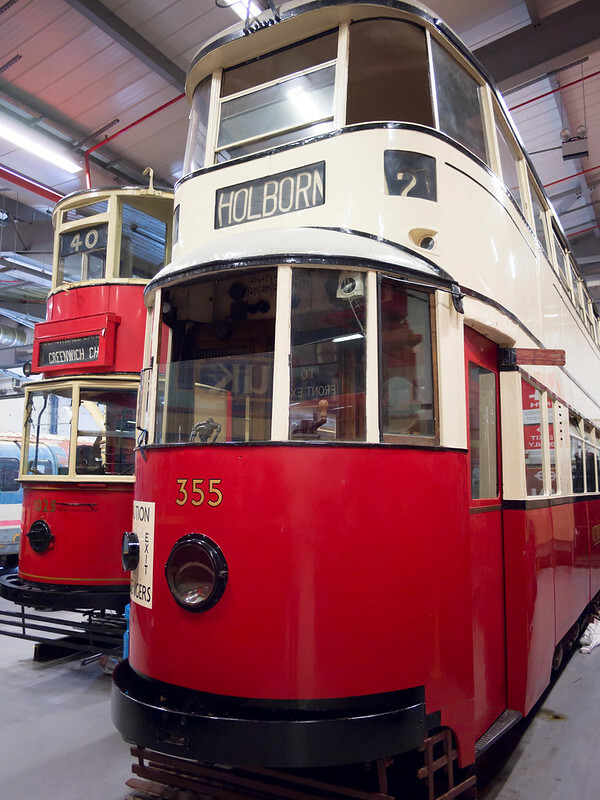 No new designs of London tram were therefore produced after 1930, although there were some refurbishments. this Google Books preview of "London United Tramways: A History 1894-1933" suggests that the motors of the early trolleybuses were either 80 or 82hp each, and states that they could accelerate from stationary to 20mph in 9.2 seconds (20mph is 32km/h). Another page of that book (the preview does not seem to give page numbers) states that the early (1931) trolleybuses ran 10,048,839 miles in a year, and had (total) operating costs of £52,756, being £0.00524996 per mile, or £0.003262871 per km. 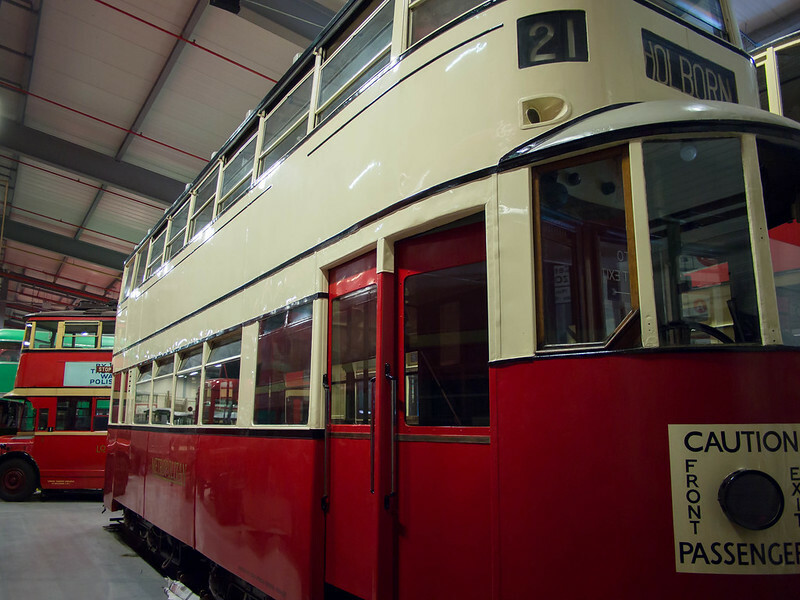 Wikipedia gives the cost of the Blackpool "pantograph" cars, luxury single decker trams, built in 1928 as £2,000 each. Some interesting information about prices of secondhand trams and new 'buses and trolleybuses in the 1950s, albeit from an unverified source: this Flickr comment states that the Feltham trams were purchased by the Leeds Corporation from London Transport in 1949 for £500 each (secondhand) and that many of them required an overhaul costing in the region of £300 at the time. A new trolleybus would cost about £6,000 at the time, and a new motor 'bus about £5,000. Edit: Another unverified source, this 'blog comment gives dimensions for the Feltham tram as 40′ 10″ long and 7′ 3″ wide. Edit 2: According to this Yahoo Groups discussion, Feltham trams had 2x 70hp motors and could do "a good turn of speed" (although I suspect limited to 20mph maximum, albeit I do not have anything to confirm this). Edit 3: According to Wikipedia, the cost of Blackpool's 16 new Flexity 2 trams in 2011/2012 (each tram comprising 5 articulated sections) was £33,000,000, equating to £2,062,500 per whole tram. my general opinion is that while track and station construction costs are broadly plausible in the pakset as it stands (assuming something like constant 1900 currency), fixed maintenance costs are absurdly high. At the moment, most structures have annual maintenance costs of the same order of magnitude as construction costs! By contrast, this document suggests that for things like bridges and tunnels, annual maintenance (note, not monthly!) is between 0.5% and 2% of construction cost, while the track itself has to be renewed on a timescale of 6 to 40 years, depending on how heavily used it is (and of course the cost of laying the track is itself usually only a small part of the cost of constructing a new line). Overall, I would like to see a huge reduction in fixed maintenance costs, compensated for by a moderate increase in running costs (gross revenue is probably about right as is). This is the document linked. Edit: On a different topic, according to this article, stagecoaches cost £130-150 each to build in around 1830. The same article posited that a coach must make £4-5 per "double mile" (that is, a mile out and a mile back) to survive (i.e., make sufficient revenue to be profitable). High maintenance is an attempt to control excessive profits made by players. If that was reduced, and running costs increased this would lead to an incentive to use more infrastructure (double track rather than single with passing places for example). For stations at least I think even 2% would be fairly low. You could think of the maintenance costs for stations as including running costs, as well as maintenance itself. So staffing costs, electricity and gas bills as well as business rates (for example Network Rail has a rateable value of £277m so pays around £120m each year in business rates, London Underground's is £59m so pays around £25m). With maintenance being on top of this, and the design life of buildings often being around 20- 30 years I think closer to 10% capital cost as maintenance would be fair. Of course, annual maintenance depends on bits per month - a perfectly calibrated value for 18 bits per month would look ridiculously high for 21 bits per month. Yes, it would. In the real world single track is largely confined to low-usage branch lines, and even then the main reason for using it is to reduce construction costs, not maintenance costs. (Has any real railway company ever ripped up half of a double-track line to reduce maintenance?) Even the original Liverpool and Manchester line was built as double track from the very beginning: starting out that way in Pak128.Britain-Exp as it stands is a recipe for bankruptcy. I'd be happy with that. Most of the station buildings in Pak128.Britain-Exp currently have maintenance costs of around 15%-30% of capital cost per month, so 10% p.a. is a factor of 20 to 30 smaller. The actual annual maintenance cost charged to the player should be the same, regardless of bits per month. What should scale with bits per month is the revenue and cost per km, since varying bits per month changes the number of real trips represented by each simulated one. Large parts of the British Rail network that survived Beeching were singled, e.g. LSWR mainline to Exeter, Swindon-Kemble on the GWR (now being expensively redoubled by network rail...) - so yes they were. wasn't most of the current british rail network built by 1870 or thereabouts? I know the main reason older rolling stock is used or reused is because there is no money to replace them with new ones. That and rolling stock is typically designed for at least 20 years of use. Has any real railway company ever ripped up half of a double-track line to reduce maintenance? Yes, it happened to almost every line in the United States after World War II. The lack of double-track, or even sufficient sidings, not to mention signalling, is why it's nearly impossible for America to run passenger trains. This is a constant source of frustration for those of us who advocate the return of the passenger train. Many of our largest 50 cities do not even have passenger service at all, or like Houston they get only three trains a week. Very short sighted of the railroads, but they had to do it because of all the government regulation and taxation, and the massive subsidies given to highways and airports. There are also plenty of cases where railway companies built a new railway line, earthworks bridges tunnels etc, all to double track standards, but only laid one line of track. They anticipated an increase in traffic which often never materialised. E.g Meon Valley railway (London to Portsmouth) - built to full mainline standards but only ever a branch line for practical purposes. It's worth pointing out that the earliest railways, like the Liverpool and Manchester needed to be double track due to the lack of sufficient communication infrastructure at the time. Since the mid 19th century this has not been a limiting factor and these days there are mainlines with a service frequency of several trains per hour that are single track. it happened to almost every line in the United States after World War II. There are also plenty of cases where railway companies built a new railway line, earthworks bridges tunnels etc, all to double track standards, but only laid one line of track. To stay on topic for the thread, some broadly relevant figures from 1839 Virginia (but by the author's own admission "not based on the experience of any particular line of improvement") can be found on page 209 of http://books.google.co.nz/books?id=SrUpAAAAYAAJ. Note the important role played by the cost of the capital (interest at 6% p.a). The last is comparable to the per km cost of major earthworks, or of a railway tunnel; it certainly shouldn't be less than the latter! A reported case in the Court of Common Pleas in 1850 (Heyhoe v. Burge (1850) S. C. 19 L. J. C. P. 243) reported that a five mile section of the Lynn and Dereham Railway (later absorbed into the East Anglian Railway Company) was constructed at a cost of £41,029. Presumably, this would have been double track, as most railways built at the time were. This would give £5,128.63 per route mile or £2,564.31 per track mile. I think that the figure excluded signalling, although the report is not clear on the topic. (For reference, the case concerned a mason and bricklayer suing for his fees after the partners of the firm to whom the railway had subcontracted the job had become bankrupt, the issue being whether a third person was also a partner and thus liable for the partnership debts). According to http://en.wikipedia.org/wiki/Lynn_and_Dereham_Railway the Lynn and Dereham Railway was single track (that's what I suspected in any case). Thank you! That is very helpful information. I did try to find the Wikipedia entry so that I could add what I had found in the case, but it did not turn up in my searches for some reason. I have now added the information there, too. The Company's first ships were purchased privately as and when required. Each had a limited life expectancy, normally four voyages to Asia over 8 to 10 years. Losses from wear, tear and wreck took their toll and suitable ships were soon at a premium, some costing as much as £45 per ton. In 1607, the Company therefore decided to build its own ships and leased a yard in Deptford. Initially, this new policy seemed to work, as the first ships cost only about £10 per ton. However, the shipbuilding and repair yards at Deptford soon proved expensive to run. The Company, ever eager to save money, had second thoughts. Later in the 17th century it went back to the practice of hiring vessels. With a rough average of 1,000 tons/ship, that gives us a building price of £10,000 per ship in 1607 prices, with purchase prices upwards of £45,000 per ship. The fact that these ships were only averaging 8-10 years and 4 voyages is an important one to consider, as in Simutrans these ships can be used for 80 years (1750-1830) and can run non-stop. Such a ship in 1750 would be worth a mint. HMS Warspite, 62 guns was built 1665-6 by Johnsons, at a cost of £6,090. HMS Hannibal, also of 1,652 tons, was built by Perrys between June 1782 and April 1786 at a cost of £31,509. That is very helpful - thank you! That would mean that £10/ton for a trading ship still applied in 1787. And that the sailing ships in the Pak are far too cheap. According to wiki, USS Nightingale cost $43,500 in 1851 for a displacement of 1083 tons. At five dollars to the pound, the formula still more or less works. And the Lightning cost £32,000 in 1854 for a tonnage (Tons burthen) of 3500 and a gross register tonnage of 2084. Anyway, the Bethia was bought (for only £1950), renamed Bounty, and refitted to Navy standards. The refitting cost was £2504 for the hull and provisions, plus £1952 for rigging and stores. Fortunately the Parys Mountain copper mine on Anglesey, Wales had recently begun large-scale production that had glutted the British market with cheap copper; however the 14 tons of metal required to copper a 74-gun third-rate ship of the line still cost £1500, compared to £262 for wood. A single coppered vessel was recorded on the register of Lloyd's of London in 1777. By 1786, 275 vessels (around three percent of the merchant fleet) were coppered. By 1816, this had risen to 18 percent of British merchant ships. Copper sheets were exported to India for use on ships built there. In the late 18th and early 19th century, around 30 percent of Indian ships were coppered. McKay also mentions the formula for estimating crew requirements: 15.5 tons per man for trade vessels. The Bounty, for its South Sea mission, was instead crewed by 46 sailors. During the 18th century, a Royal Navy Able Seaman was paid (after deductions) 22 shillings and 6 pence per month. Although pay was reckoned by the 28-day lunar month so the annual rate of pay was somewhat more than 12 times this. A farmworker of the era might earn £3 to £4 per year, around a quarter to a third of this. Wages on merchant ships were higher - 25 to 30 shillings per lunar month - and increased further during wartime (merchant pay rates 70 shillings per month at London and 35 shilling at Bristol were offered during the Seven Years War). Although merchant crews could be cheated of their pay in several ways by dishonest ship-owners. Assuming 25s/months, a sailor would earn £20 a year. The Pak128 1050-ton clipper, assuming a crew of about 60 (with officers earning considerably more, of course), would thus cost over £1200 per year in wages alone. If the ships listed are typical, then British clippers were only half as large as their American counterparts. I'd say a typical tonnage would be about 700-800 tons. Wonderful research! There is also a significant cost difference between a pure merchant ship and one outfitted with guns and other protective equipment in order to stave off piracy attempts (yet another cost/risk to long distance shipping that doesn't exist in Simutrans!). A cost £10,000 for an East Indiaman seems more appropriate compared to starting capital in 1750, etc. An increase in operating costs to around £10.00/km might work, but this would require some testing to verify. Coupled with a reduction in profits from some of the high value goods (milk, planks) this will make the player much more careful about setting up a well functioning transportation system that maximizes tonnage hauled per ship.